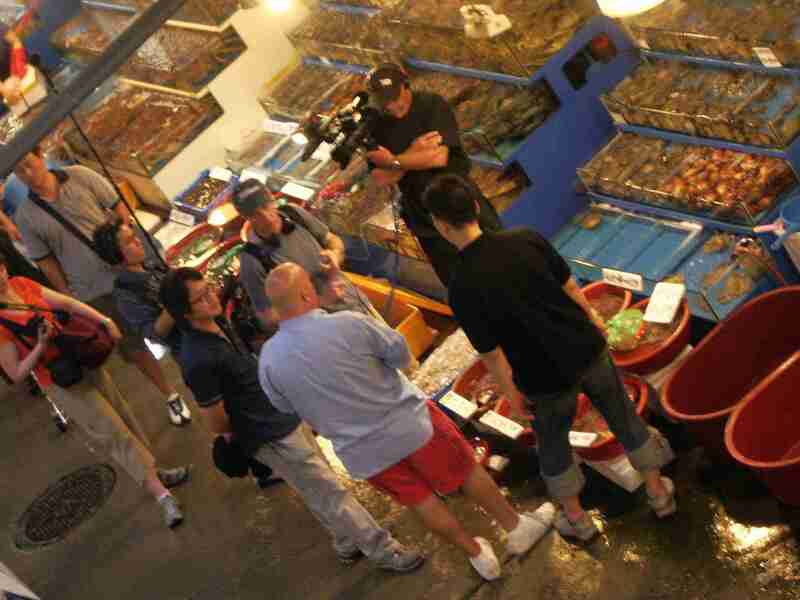 One of the best places to visit in Seoul is Noryangjin Fish Market. It’s like an aquarium where you can eat the exhibits. Unlike a lot of fish markets around the world, many of the fish are still alive in tanks. Because of that, it doesn’t smell as rank as other markets. 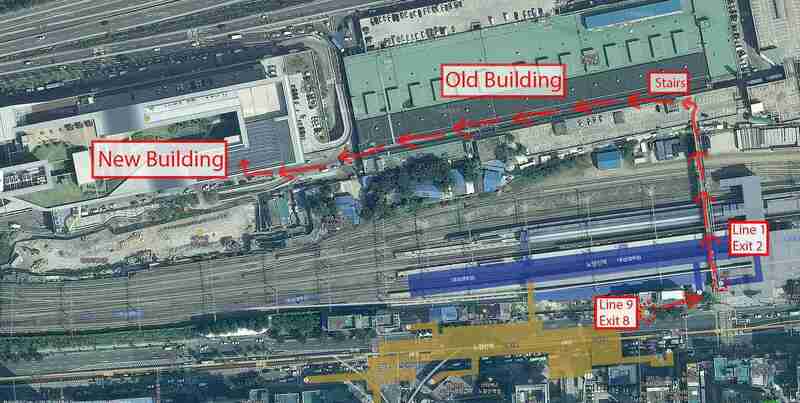 This is a new guide because Noryangjin has been going through a transition from the Old Building to the new one. It’s had its controversy. Some vendors protested the move, and you’ll see spray painted protests on the Old Building. It’s classic and has a lot of character. It doesn’t smell that strong. It isn’t beholden to the elements, so it’s cool in the summer and warm in the winter. The restaurants are much cleaner. If you want a fun guide and eating companion, book one of our Mix & Match Private Tours. 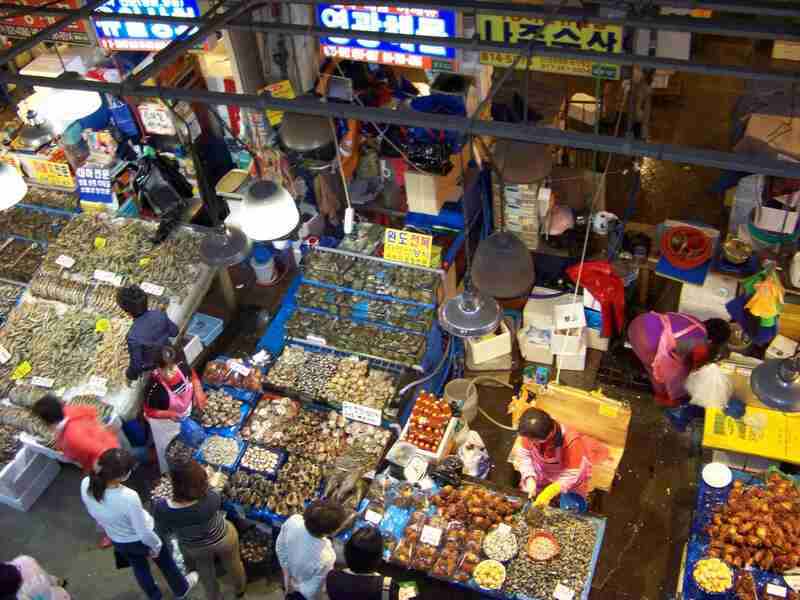 We can take you to Noryangjin Fish Market and other great finds only local foodies know. This isn’t like many fish markets around the world. Many of the fish are living in aquariums. They’re not decaying on a counter. The freshness of the fish is the same all times of the day. The only things I’ve observed over the years is that it will get busy Friday and Saturday in the late afternoon and early evening. Groups of salary workers and seafood partiers are venturing out to get their catch for an evening of Neptunian bacchanalia. 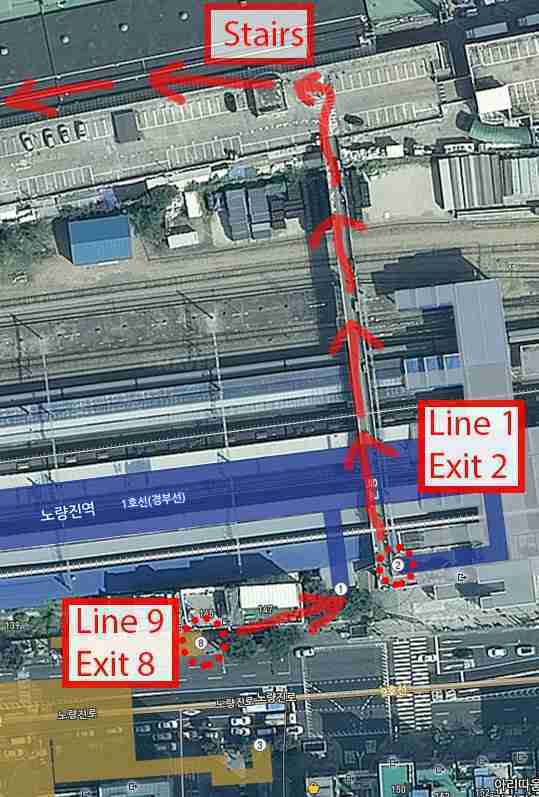 Noryangjin Station is one of Seoul’s most confusing. The reason is that there are two unconnected stations on two different lines. There are TWO EXIT 1s! The original station connects to Line 1, the dark blue line. 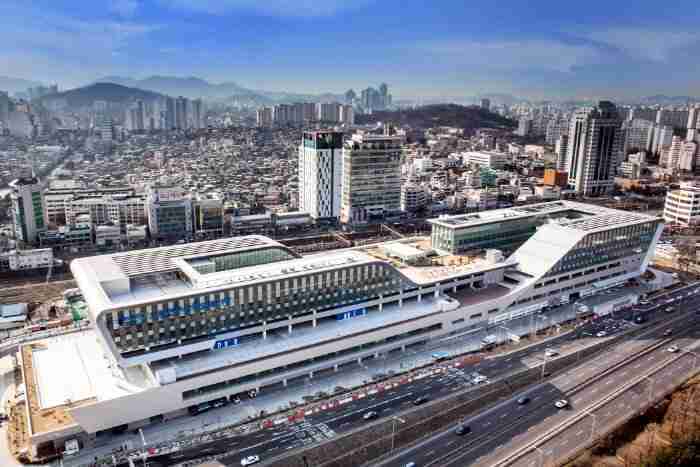 The new station connects to Line 9, the gold line, the only privatized subway line in Seoul. Click Image for Larger Version. Image from Naver Map. 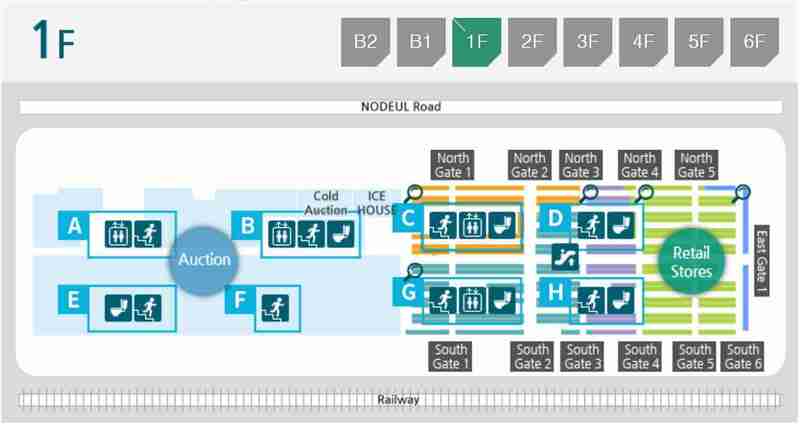 If you come using Line 1, you just go out the turnstiles. 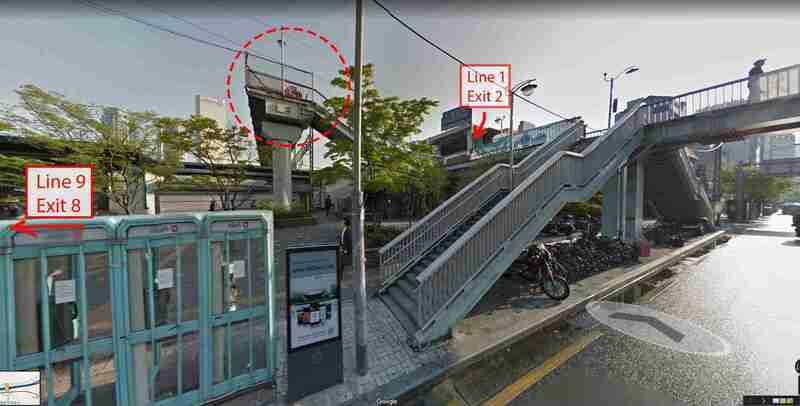 There’s a convenience store and a coffee shop inside the station and stair/escalator going down outside the station. What you need to do is go down and then up the stairs to this overpass. If you are using Line 9, go through Exit 8. The narrow sidewalk opens into a small plaza with stairs. Go up the stairs, turn left, and go up more stairs on your left. Refer to the pictures above. Cross the overpass that runs over the train tracks. There’s a great view of Yeouido Island and the Seoul skyline and mountains from here. You’ll end up on the rooftop parking lot of the Old Building. There’s an entrance with stairs. Go down the stairs. You’ll come out on a parapet. Do your best Eva Peron “Don’t Cry For Me Argentina” impression as you look down on to the fish market. The glory days of the old building are over. Much of the building is not in use. What I like about the Old Building is how it hardly smells. It’s open air. Water is always flowing on the floor. That reminds me–dress for the season and don’t wear your nicest shoes there. UPDATE 2019: I’m hearing that they’ve turned off utilities in the Old Building. I don’t know if that’s true and what effect it’s having on the vendors. The main row you head to first after you go to the first floor is the shellfish and octopus vendors. They’re not aggressive. They’re assertive. They’re competitive. The shellfish and live “swimming fish” vendors are most so. It’s rude to play with the seafood without buying. Always smile and be polite. Don’t let them push you around, though. Just move on. Also, don’t worry about getting cheated. There are Noryangjin apps in Korean that keep up to date with seafood prices. I’ve found that the Noryangjin vendors generally sell their wares a hair higher than the places that cater exclusively to restaurants. They don’t fleece tourists. They’re good folk. Watch for vehicles rushing through the main floor. It’s an active market that caters to restaurants all over the city. This is the classic part of Noryangjin that always is close to my heart. Bizarre Foods was filmed in this section in August 2008. Read my blog post about the filming here. If you want to try the squirming octopus, you can ask for it here. In the past, the vendors have set us up with an impromptu table with chopsticks and dipping sauce. Further down the main row are the last remaining live fish dealers in the Old Building. Cats like to hang out here, too. For me, the treasure of the Old Building is the row behind the shellfish dealers and the aquariums. That’s where they sell the fish that don’t need to be live. This includes the infamous fermented skate (stingray), which reeks of ammonia. I’ve developed a taste for it over the years, but it took a long time and a lot of training. There’s also jellyfish, hairtail (looks like eels), and sometimes a whole tuna. What I like to do with tuna is point to a specific part that a want and have the vendor carve it out. Be observant. This is typical city life. I enjoy just seeing what the vendors are eating for lunch. Keep following the main road, where the swimming fish aquariums are. It will lead outside the Old Building and towards the New Building. Compared to the Old Building, it feels like a shopping mall. Enter any gate you wish. The main landmark to orient yourself on the first floor is the escalator. There aren’t many vendors in the green area. The vendors are similar to what you saw in the Old Building. Maybe more lobster. Just wander here. I wouldn’t buy any seafood yet. There’s so much exploring to do. This isn’t like the fish market in Tokyo. I’ve seen auctions in various markets. They aren’t as exciting. Kinda subdued. Besides, we have all this live seafood in the area. It’s just as fresh at 6 p.m. as it is at 4 a.m.
After a good wander, go up the escalator. The second floor is where I do business. I buy my foods and eat them here. I like the restaurants. They’re so much cleaner than they were in the Old Building. I don’t have to be on the watch for cockroaches. Many of the restaurants are connected to specific vendors. They’re mostly named after famous seafood areas in Korea. The move to the New Building has made it possible for new types of restaurants and pubs to spring up. This is what I usually like to do and see. At the top of the escalator is a knife vendor. This is good for souvenirs. Just make sure that you put the knives in your checked luggage. These are good quality sashimi knives that will shave the hair off your arm. This is my favorite part of the whole market. All these fermented salted seafood. These are used to make kimchi, muchim (salads), to put on steamed pork wraps, and to just eat on the side. There are toothpicks available to try samples. The fun is just trying things. Don’t even try to guess what they are. I’ve had guests on my tours like some things so much, they bought a small pack to bring back to the hotel. One of my guilty pleasures is the spicy smothered raw oysters with some buttery Ritz or Zec crackers. It helps to have a bottle of water with you. They sell not only fried shrimp. Other fried goodies and bottled craft beers occupy the menu. THIS is the new Noryangjin. 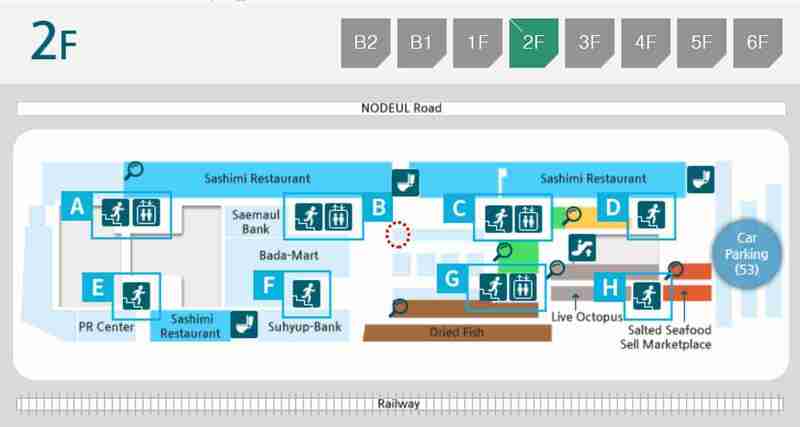 In section F, there are a fried seafood drinking spot and a Japanese sushi restaurant. They are both great. If you don’t want to deal with the vendors, you’ll have just as good of a time in any of those places. This is where I usually get my seafood. The dotted circle is the specific vendor I go to out of habit. I’ve dealt with them before, and they know what I like. There’s a woman selling octopus and shellfish and a man selling live fish. Many vendors have restaurants. The guys I buy from are connected to Haeundae 해운대, which is named after Busan’s most famous beach. A live fish will run you W30,000 to W50,000. Just point and gesture how many of fish and shellfish you want. 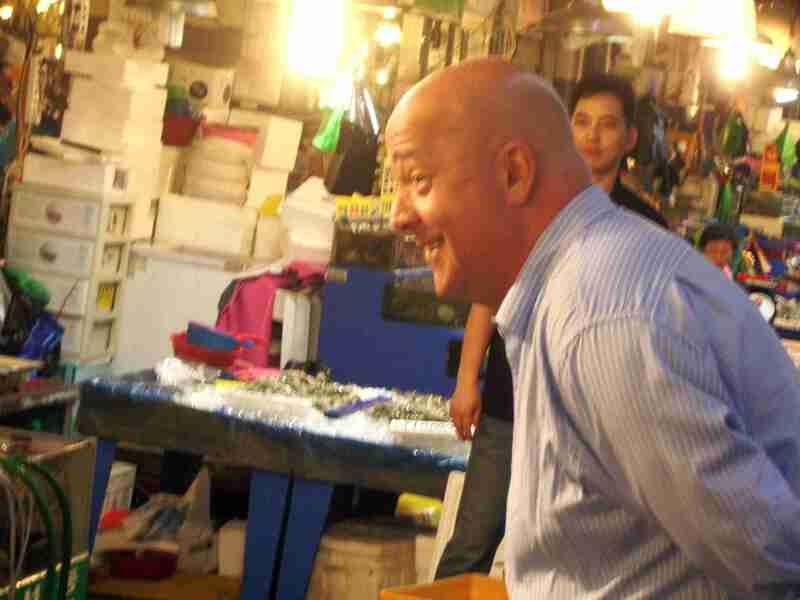 Korean “sashimi” is called “hwe.” The vendors will say, “Sashimi,” because that’s the word they know tourists know. Unlike Japanese sashimi and sushi, it’s not aged. It’s fresh. 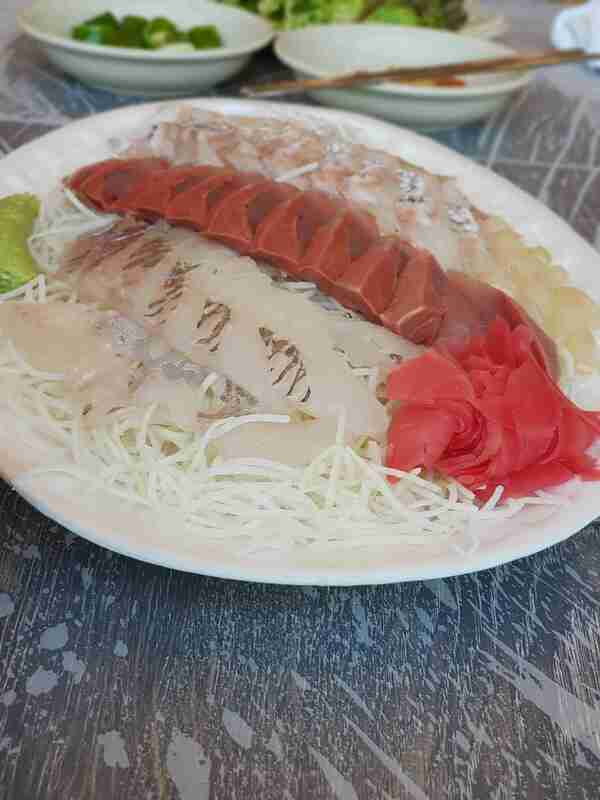 It much firmer than sashimi and has a clean ocean taste. The most common hwe are flounder/sole, rockfish, salmon, and tuna. Oh, you want some Korean words? Here you are. I’m including the official romanization and a rough pronunciation guide in parentheses. After you choose and pay for your catch, someone will guide you to the connected restaurant. They’re pretty much all the same, so don’t resist. They’ll likely want to get you going before your fish is dispatched and sliced up. If you want to watch the gruesome sight of how animal becomes food in five minutes, stick around. When you enter the restaurant, the server at the front likely will ask you how you want everything set up. 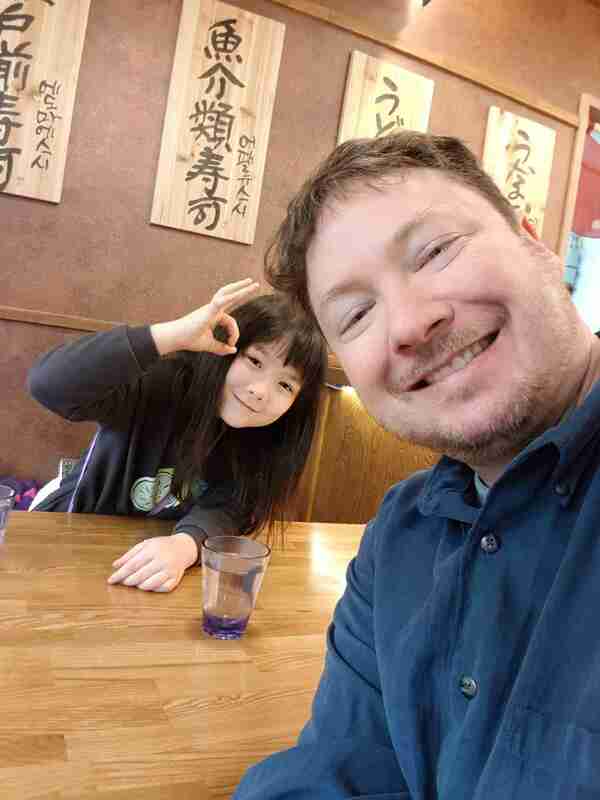 They’ll know right away which one is sashimi. For the other things, if you don’t know, just nod and agree. I’ve had great surprises that way. 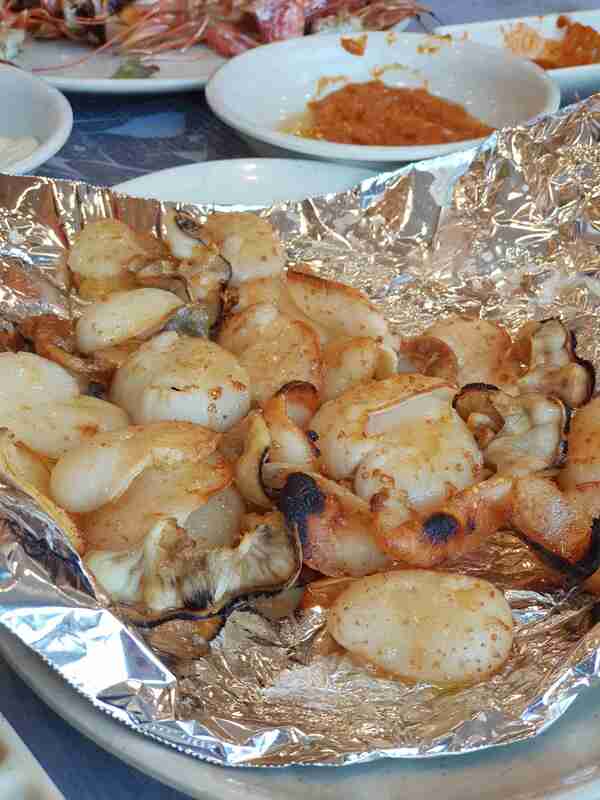 Many times the shellfish will be steamed (jjim 찜) or grilled (gwee 구이). 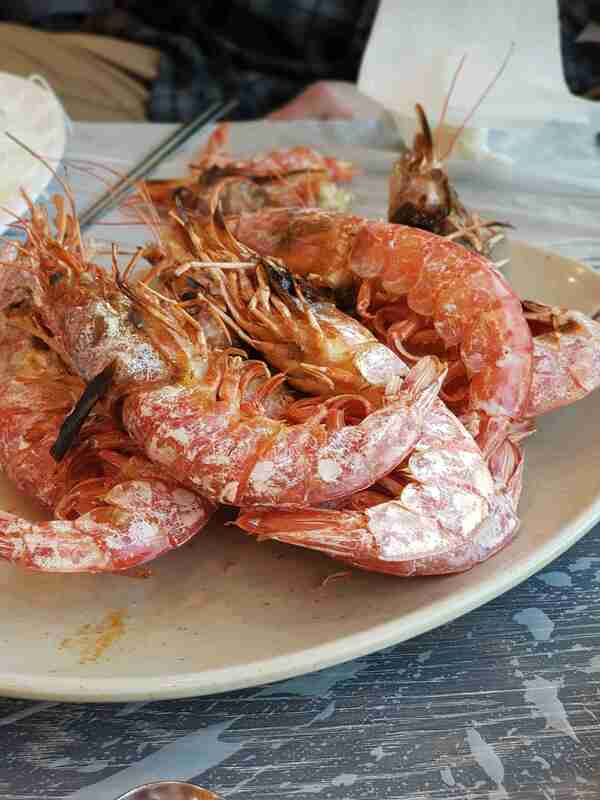 I particularly ask for the shrimp to be salt grilled (sae-u sogeum gwee 새우소금구이). The result is a shell so brittle that you can eat the shrimp shell and all. The squirming live octopus, again, is called San Nakji 산낙지. I don’t recommend trying to eat one whole. In fact, the server likely will refuse to serve it that way because it’s too dangerous. In a way, it’s crueler than quickly chopping it up with a knife. Even though the chopped octopus is squirming, it’s no longer alive. I’ve timed it twice. It takes fifteen full minutes to eat an octopus whole. Get it chopped. After they take your catch, they’ll guide you to a table. Order your drinks. Soju is the traditional choice, but I also like to have some beer (maekju). You’ll have some sauces set out for you. Vinegared chili sauce (Cho-gochujang) – This is the typical Korean style dipping sauce. I like mixing it with wasabi, making it taste a lot like cocktail sauce. Pohang sauce – It’s a mix of fermented bean paste (Doenjang), chopped garlic, chopped green chilies, and sesame sauce. It originates from the southeastern port of Pohang. Mix it up. It’s great! Sit back and enjoy. You deserve it. Mid-way through your meal, ask for Maeuntang (MAY-oon-tahng) 매운탕. It’s a spicy boiling soup made with the bones of your fish, along with healthy greens. I like taking some of the leftover sashimi and dipping them in the soup like shabu-shabu. This is the traditional way to end a proper Korean hwe meal. I always have DVD bonus extras. One of my favorite secret corners of Seoul is Cup Rice Street (Cup Bap Geori 컵밥거리), right on the other side of Noryangjin Station. It’s a row of streetside vendors catering to students studying for professional exams. Cheap. Lots of variety. Unique. And Good. Be on the lookout for the infamous Bomb Rice (Poktan Bap 폭탄밥). It’s a super spicy variation of Bibiimbap. Exit the New Building and head towards a tunnel. Exit and walk east to the subway station. Cross the main road and follow the street. Pass a McDonald’s and a gas station before you get there. I want to thank Dino for pushing me to create this guide. Please leave more tips in the comments.